The ESPN/ERA-EDTA Registry has been developed to increase the amount and the quality of information on paediatric renal replacement therapy (RRT). On this website, ESPN/ERA-EDTA Registry activities and information on paediatric registries in general will be provided. During the past months the following papers have been published at the ESPN/ERA-EDTA Registry. The first, titled Recovery of kidney function in children treated with maintenance dialysis from Marjolein Bonthuis et. al., was published in Clin J Am Soc Nephrol. The second, by Nicholas Chesnaye et. al., was published by Nephrol Dial Transplant, on The association of donor and recipient age with graft survival in paediatric renal transplant recipients. 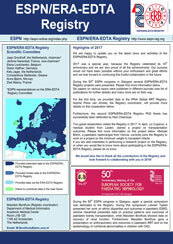 The ESPN/ERA-EDTA Registry highly welcomes paediatric nephrologists to work on the Registry data. Topics could include, but are not limited to, nephronopthesis and regional variation in FSGS. Examples of research projects or internships can be found here. For example Evgenia Preka, a paediatrician from Brussels visited the registry to work on eGFR at dialysis initiation in collaboration with the ESPN Dialysis working group. Bram Smit, a medical student from Amsterdam, has conducted his scientific internship on ESPN/ERA-EDTA Registry co-morbidity data. Please contact us via espn-reg@amc.uva.nl if you would like to join the Registry, want more information on research projects or if you have any other question. Thank you all for making the ESPN/ERA-EDTA Registry work! 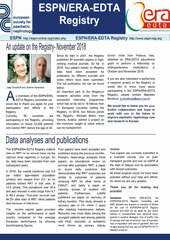 2016 Paediatric Data The new ESPN/ERA-EDTA Registry newsletter is online.